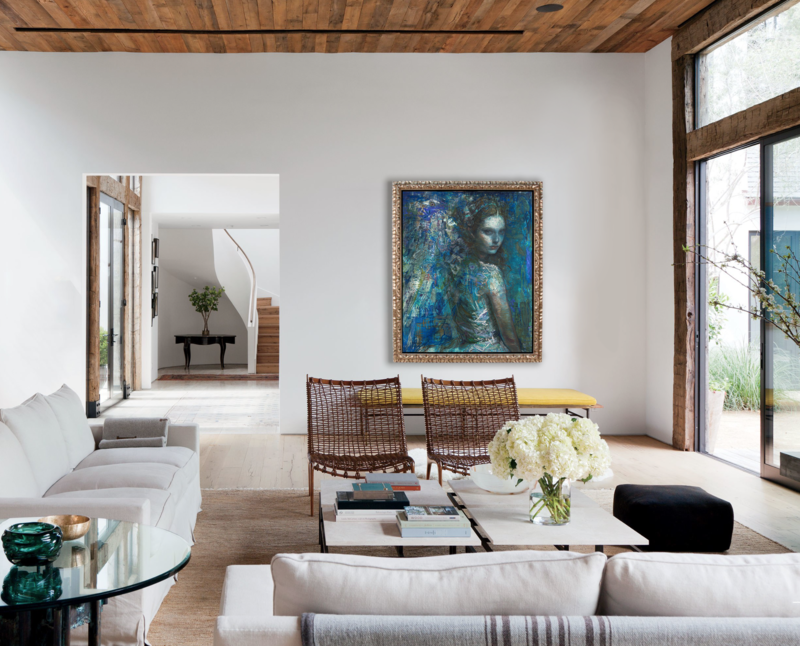 When selecting artwork it is important to consider the mood that you want to create in a space. Artwork has the ability and power to transform a space, so take a chance and design with color on the mind. Color can completely alter the atmosphere of your space—from vibrant, impassioned reds to calm, soothing blues. 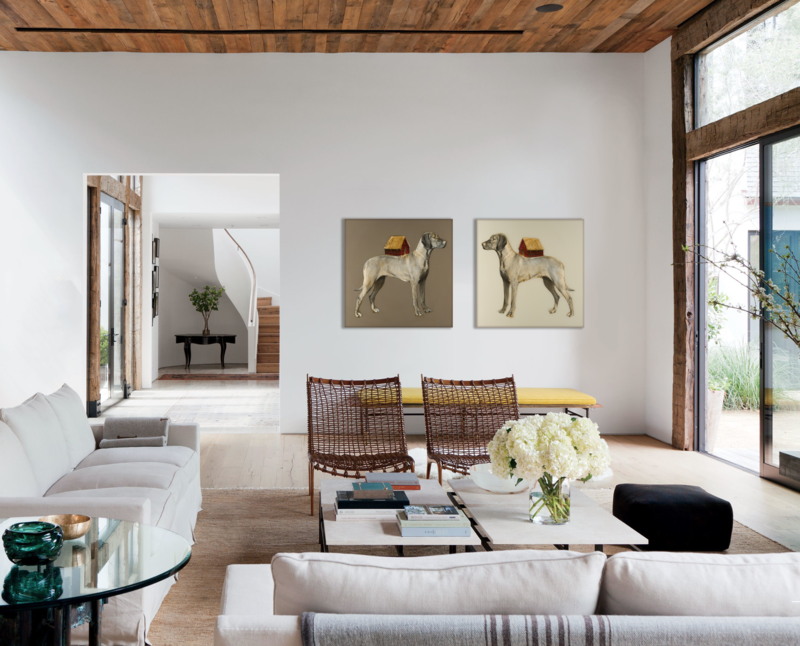 Take a look at how this space—washed with natural light and layered with neutral tones, is transformed with color. Behold the power of art. Dwyer, “Blue Muse II,” Mixed Media on Canvas, 52 x 42 in. Charles Dwyer’s “Blue Muse II” gives a point of contemplation and magic to this open, airy living room. The deep, layered shades of blues, cerulean, and turquoise infuse this gathering space with a bold energy, while the paler, softer blues exude a sense of calm. The mystical muse fills the room with a whimsical and emotive presence; Turned mysteriously to her side, she seems to invite you into the portal to another world. Noice, “Beneath A Golden Ridge,” Oil on Canvas, 72 x 72 in. Marshall Noice’s brilliant painting renders the tamed interior into a lively, rejuvenating reservoir. Shades of crimson and persimmon raise the atmosphere’s energy level, inviting conversation and creating excitement. The yellow hues channel joy and happiness, welcoming friends and family into this space. Invite a positive, optimistic perspective with this vivacious piece that contrasts the otherwise neutral palette of the room. With an earthy palette and whimsical composition, this pair from Anke’s Grid Series creates a sense of natural comfort in this living space. The coffee and cream color palette adds to the layering of neutral hues and whites throughout the room, while the dogs’ harmonious symmetry adds a pleasing sense of repetition. The overall effect is open and airy with a nod to nature and ease. Choose artwork that will affect your state of mind and establish a sense of the mood you seek—find inspiration in the power of color. Your home is your personal palette. To experience works to set the tone in your space, visit one of our galleries and spend some time with one of our experienced art consultants. Let us be your guide on this journey.